When the weather’s fine (or hot, muggy and very sticky – I’m looking at you, London!) the last thing you want to do is spend hours hovering over a hot stove. You want clean, fresh flavours, meals that fill you up and keep you going without sending you into a bloated food coma. Well, how about a quick, easy, delicious, nutritious little number you can whip up in minutes? This is just such a recipe! Heavenly buttery salmon that falls into flakes at the slightest touch and melts in the mouth. It’s a very forgiving recipe (fool proof in fact) so you can play around with the quantities depending on how many you’re feeding. Pop your oven on to 190C/375f, take out a baking sheet and some tin foil. You’re going to make a package for the salmon so tear off as much as you need. Lay the foil on to the baking tray and slice up your lemon. Lay your lemon slices onto the foil. Place the salmon on top. 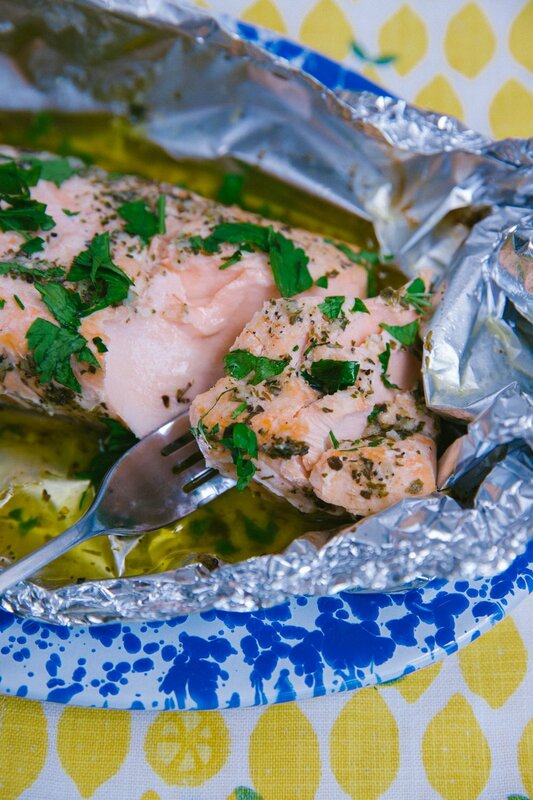 Fold your foil up into a little open-topped boat, making sure the ends are good ‘n’ sealed. Now you can make your garlic butter. In a pan gently fry your garlic, dry herbs and butter together. It should only need a minute or two. Sprinkle in a little salt & pepper. Fold the top of the foil over to seal. Place on the middle shelf of your oven for 15-20 mins, until cooked through. Once it’s done, sprinkle with parsley. You can portion it up onto plates or serve the whole thing family style in the middle of the table. Be sure to get a good drizzle of that sauce! Pair with a fresh salad or fluffy new potatoes – ideal for butter dipping. Summer suppers don’t come much butter than this.